We often hear or read about how the marketing world is constantly evolving and changing and how companies must constantly adapt new strategies and evolve in order to remain successful in such transient times. 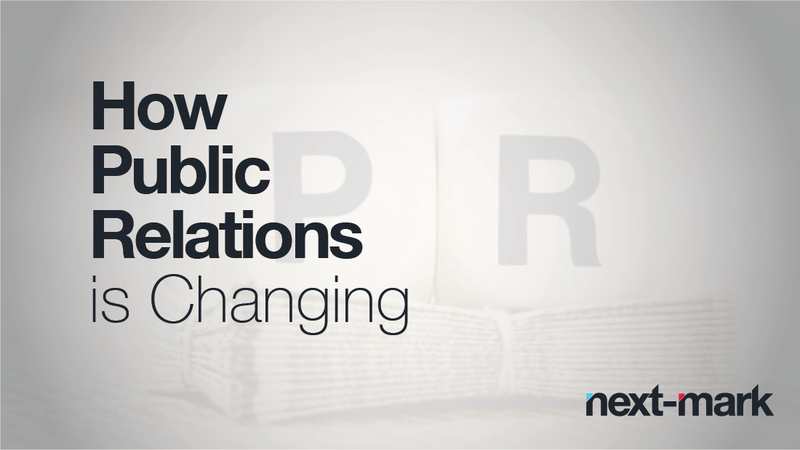 However, what we do not hear enough about, is how public relations has changed, and how companies must modify and tweak their PR practices in order to remain successful. We as a marketing communications organization know that the PR world is in rapid change. The following are a few trends that are pressing organizations and public relations professionals to revaluate their strategies and step up their game. Whilst working for Next-Mark, I’ve found it has been very important to develop and foster relationships with key journalists not only because it can benefit both parties but also because this can turn a negative story into a positive one. However with that being said, relying on those relationships to get the desired coverage for your company or clients is not enough. Relying solely on these relationships to get coverage does not show that your capacity to understand your companies or clients desired message and how you can fit that into the ever-changing editorial needs of your target publications. A lot of times, timing, relevancy and a degree of creativity can trump relationships. Today, writing bylines and arranging meetings with reporters and clients won’t allow you to remain competitive in the PR world. This might have worked in the past but things have changed. Today, a good blog post or a creative social media post has the potential to generate as much brand awareness as a well-written story in a news publication. PR professionals now have to be comfortable experimenting with innovative stories, and using a variety of platforms and formats. Generating newsworthy content that journalists are interested in using has become increasingly difficult, so it is encouraging PR professionals to think more out of the box and push the limits. While I am still early on in my career, one thing that has been clear since I started working in the PR industry is that if you work for an agency, it is of the utmost importance to understand not only the industry in which your clients operate, but also understand the company itself and their desired brand message. You must become a subject matter expert. This has always been the case however, what has changed over time, is how much PR professionals are expected to understand and the reliance on them to make critical and timely decisions. A successful PR expert will develop a deep understanding of the industry and of an organizations products. If you do not do these things, guaranteed someone will be found that will! Through all the brand communications it has been and always will be important to select the relevant channels and collaborate on the activation. In order to keep up with the times we must be brace and creative in all areas of communication, and while everything is changing, we need to remember to incorporate strategy in all that we do. Trying to navigate the PR world – I know we can help – just ask!